Here in the UK, we're lucky to live in a climate mild enough and with sufficient rainfall to be able to grow probably the widest range of plants on Earth, especially with a little bit of intervention. There are still a few things to gladden the heart! I've just come back from the 46C heat of Egypt, where they are extremely limited in what they can grow: the average rainfall in some parts is 2mm a year. I returned to find that it has been a bit damp round these parts. In fact when I did my rain dance I was hoping for a steady drizzle, not 20,000 Leagues Under the Sea. This has meant nothing has died of thirst, and the Himalayans are positively reveling in it while the Caucasians are even the bearded Irises of Monet's paintings will be hating it, throwing into sharp relief the problems I face trying to grow plants from both regions. 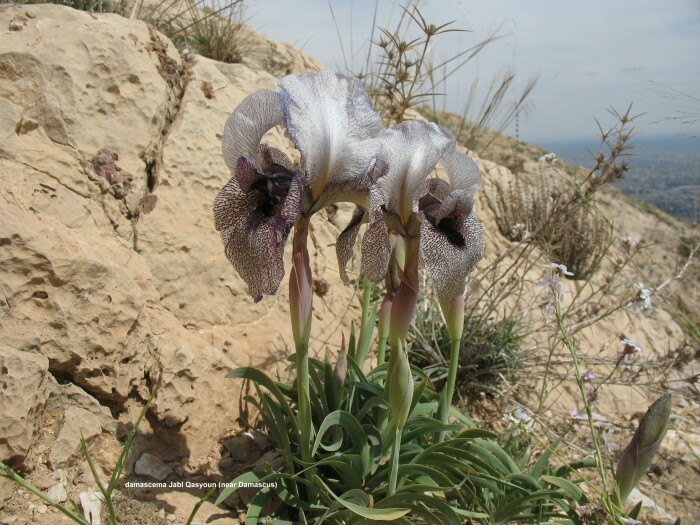 It's all about keeping the rain off those that need to think it's still high summer: while away I visited Jordan where the almost black Oncocyclus Iris Jordana is the national flower and we are talking about hillsides that haven't seen a raindrop in months if not years. It was like the set from a Spaghetti western (and Indiana Jones). I can't provide that but I can but do my best with clear plastic boxes. I keep these propped open a few inches most days to let air circulate but keep rain off. So far this approach has worked but when I start watering, next month, we'll see if it's a winter wonderland or a botrytis heaven for them. Speaking of Botrytis, the pelargoniums in the sealed up "greenbouse" seem to have taken umbrage at being cosseted and developed terrible mould. I've taken them out and will cut off and dispose of the infected areas as soon as the weather allows. Too muchtoo close, too wet was the problem I think. Elsewhere the Crocus sativus have burst through (a squirrel's been having a good dig at some of the bulb pots but he or she doesn't seem to like Irises or Fritillarias, which is a reflief! and the Iris sibirica hybrids are now four or five with the lily hybrids well on their way to being 20 or so. I think I've leave the lilies in situ over winter so they have a chance to form little bulbs, rather than upsetting them now. Mind you, I made the mistake of leaving Digitalis ferruginea var. gigantea too long and the result was a squishy mess from which I think I've rescued half a dozen or so. Oh, a load of seed has arrived from my friends at Chilterns, including Iris attica, Gladiolus tristis, Gentiana acaulis, Primula alpilcola, P. laurentiana, p x bullesiana (as if I need more candelabras), Narcissus Serotinus, Lewisia cotyledon 'Sunset strain', Meconopsis integrifolia, Penstemon cyananthus and Penstemon confertus. I'll keep you posted on progress!